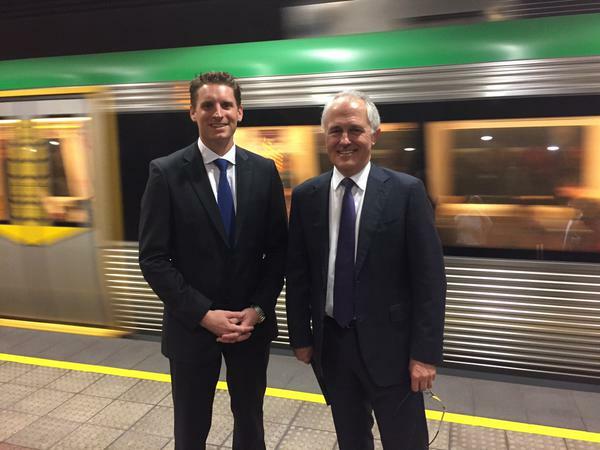 The new Prime Minister Malcolm Turnbull will abandon the ban on urban rail funding and have a Minister for Cities instead of an Assistant Minister for Infrastructure. In a 14 minute press conference yesterday announcing his new ministerial line up, Mr Turnbull dedicated almost 3 minutes to cities and urban transport in which he stated that “infrastructure should be assessed objectively and rationally on its merits” and that “there is no place for ideology here at all”. Mr Turnbull, an avid promoter of public transport who still intends to catch public transport as Prime Minister, is famous not just for taking public transport but also announcing to the world that he takes public transport. Very exciting day today. Catching second favourite bus the 333 to visit opening of Barangaroo headland park with grandson Jack! At the risk of being teased again by @annabelcrabb am on the train to UTS via Central for a big @AusDTO tech jobs announcement. “Livable vibrant cities are absolutely critical to our prosperity. Historically the federal government has had a limited engagement with cities. And yet that is where most Australian live. It is where the bulk of our economic growth can be found. We often overlook the fact that livable cities, efficient productive cities, the environment of cities are economic assets. You know, making sure that Australia is a wonderful place to live in, that our cities and indeed our regional centres are wonderful places to live is an absolutely key priority of every level of government. Because the most valuable capital in the world today is not financial capital, there’s plenty of that and it is very mobile. The most valuable capital today is human capital. Men and women like ourselves who can choose to live anywhere. We have to ensure for our prosperity, for our future, for our competitiveness that every level of government works together constructively and creatively to ensure that our cities progress. That federal funding of infrastructure in cities, for example, is tied to outcomes that will promote housing affordability. Integration is critical. We shouldn’t be discriminating between one form of transit and another. There is no ‘roads are not better than mass transit’ or vice versa. Each of them has their place. Infrastructure should be assessed objectively and rationally on its merits. There is no place for ideology here at all. The critical thing is to ensure that we get the best outcome in our cities. The former Assistant Minister for Infrastructure Jamie Briggs will become the Minister for Cities and Built Environment. Transport and urban development consultant Alan Davies points out that this moves the cities portfolio out of the Department of Infrastructure, where cabinet member and Minister for Infrastructure Anthony Albanese held responsibility for the then Major Cities Unit; shifting it into the Department of the Environment. Mr Briggs will not be in cabinet, and will instead rely on his senior: the Minister for the Environment Greg Hunt. Mr Davies raises concerns that yesterday’s announcement was mostly symbolic and that he wants to see action, saying “I don’t think it can just be assumed the appointment of Mr Briggs heralds a new dawning for cities that goes beyond rhetoric”. He adds that Mr Briggs “is neither personally influential – he’ll have to rely on Greg Hunt’s efforts in Cabinet – nor pushing policies that most in his party think are critical issues. Mr Briggs administrative support will come from the Department of Environment; in terms of the Commonwealth’s influence on urban policy that’s a much less relevant portfolio than Infrastructure”. Delighted to continue the work as Environment Minister but with an increased focus on renewables, cities and built Env't. This is a big turnaround from the previous Prime Minister, Tony Abbott, who refused to fund urban commuter rail and abolished the Major Cities Unit. Mr Abbott argued that the funding of public transport was not in the government’s knitting, preferring to leave this to the states. He promoted himself as the infrastructure Prime Minister, committing billions of dollars to transport infrastructure so long as that infrastructure was roads or freight rail. This was consistent with the views on transport outlined in his 2009 book Battlelines. But this was not a unanimously held view within the Coalition. The Deputy Prime Minister Warren Truss, who also holds the title of Minister for Infrastructure, has voiced his willingness to provide funding for rail projects: “The Federal Government is quite happy to fund metro rail projects” (Source: Herald Sun, Regional Rail Link unites state and federal MPs, 14/06/2015). Meanwhile, the Commonwealth Government has been willing to provide funding for urban rail projects as part of its asset recycling program; under this program it has provided funding to the NSW and ACT Governments for the Sydney Metro and Capital Metro projects. 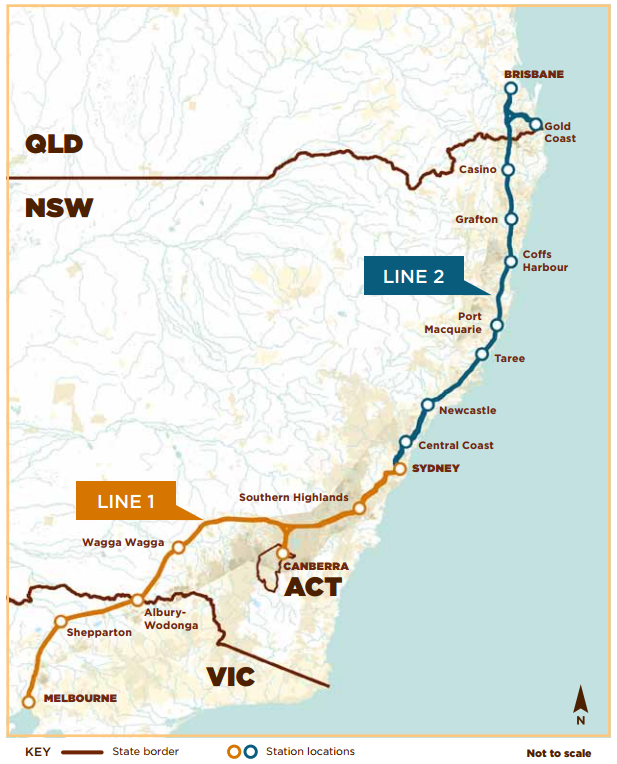 NSW has a number of rail projects currently being planned which lack funding: the CBD and South East Light Rail extension South of Kingsford, light rail around Parramatta beyond the first line currently being planned, and a heavy rail line out to Badgerys Creek from the current South West Rail Link terminus at Leppington. But, these projects are all still in the planning phases and none will be shovel ready for many years. So the real test for the change of policy is likely to come from outside of NSW, with projects like the Melbourne Metro in Victoria and Brisbane’s Cross River Rail in Queensland. However the most immediate project, which is both ready to go from a planning perspective and could be completed in the next few years, is the extension of the Gold Coast light rail. The Queensland Government is seeking to complete it in time for the 2018 Commonwealth Games, but has been unable to find sufficient funding for it. The initial line was funded jointly by the Commonwealth, Queensland, and Gold Coast Governments. The extension has the support of local MP Stuart Roberts, a member of the LNP and Turnbull supporter, and also the Queensland Government. Queensland Deputy Premier Jackie Trad has called on Mr Turnbull to commit to funding the extension within a week, otherwise she argues that construction will not be able to commence in time to complete the project before the start of the 2018 Commonwealth Games. If this is the case, then Mr Davies’ question as to whether Mr Turnbull’s move is purely symbolic or not will be answered very soon. Discussion on the need for and how to achieve an infrastructure boom, particularly in light of a fading mining boom, is continuing. The need for an infrastructure boom was outlined here on this blog last week, and a few days after in an article on The Conversation, by Peter Sheehan from the University of Victoria. In it, Prof Sheehan explains that the mining boom has three phases: (1) rising resources export prices relative to import prices, (2) an expansion in mining capacity via investment in the resources sector, and (3) an increase in the quantity of resources exported. Each of the three leads to the next, later dropping back due to cause and effect. For example, rising prices of iron ore eventually lead to a greater quantity of iron ore exports, which brings iron ore prices back down again. It is the first two phases which have peaked and beginning to drop back down to normal, while the third is starting to pick up steam. Prof Sheehan predicts that mining investment, the second of the three phases, has just recently peaked at $100 billion in 2012-13, but could fall to about half that in the next two years. Demand management is therefore needed to maintain investment and employment, thus preventing a recession. Given Australia’s infrastructure deficit, which he estimates at $700 billion; he calls for finding ways to commit to $200 billion in infrastructure projects over the next few years, thus filling the expected $50 billion a year hole left by falling mining investment. With state governments lacking significant revenue generating opportunities, he calls for federal government involvement; if not through direct funding then via guarantees. Other funding options include the sale of existing assets to build new ones, known as “recycling assets”; or through the private sector. The requirements for private sector involvement in building infrastructure was recently discussed by Garry Weaven, Chairman of the investment company Industry Funds Management (the relevant part begins 3 minutes into the 10 minute interview). Mr Weaven’s main concern is about how much risk the private sector bears in relation to infrastructure projects. Recent financial failures such as the Cross City and Lane Cove Tunnels in Sydney or the CLEM7 and Airport Tunnels in Brisbane have made the private sector wary of new toll road projects. He points out that “[these deals have] been put together by syndicates who are only concerned to extract value out of making the deal happen, not out of the long term value of the project”. However, the value he refers to appears to be value to the private investors, rather than to the community. While such projects were a financial failure from the investor’s perspective, the community obtained brand new pieces of infrastructure in each case, often at no cost to the taxpayer due to funding coming from user access fees. However, Mr Weaven suggests that there are around $50 billion in Australian super funds and foreign pension funds available over the next 5-10 years which could be used for infrastructure in Australia. This would go a long way towards the $200 billion target that Prof Sheehan called for in The Conversation article above. But much of this can only be accessed if investor concerns about risk are addressed. When asked what could be done to reduce investor risk, Mr Weavan provided a number of possibilities; such as guarantees, cash, equity, or loans. But his focus was on having governments build a project first in order to prove traffic levels with a given toll level, then selling it to the private sector. This is the model that is being used for the NSW Government’s WestConnex toll road, a project that Mr Weaven also praised for being funded by the sale of Port Botany (an example of the asset recycling mentioned earlier). Such proposals are not magic bullets to every infrastructure project, the devil is in the detail. Indeed, the inability of public transport to operate at a profit means those projects will almost certainly have to be entirely built and owned by the government, though franchising of their operations to the private sector is an option, as currently exists with buses and ferries in Sydney. 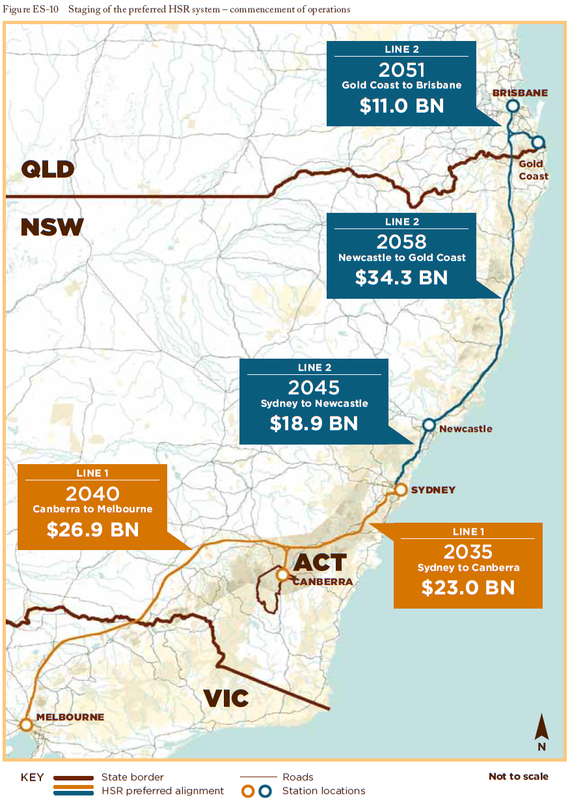 With this in mind, $50 billion would put a serious dent in the infrastructure Australia needs in coming years. 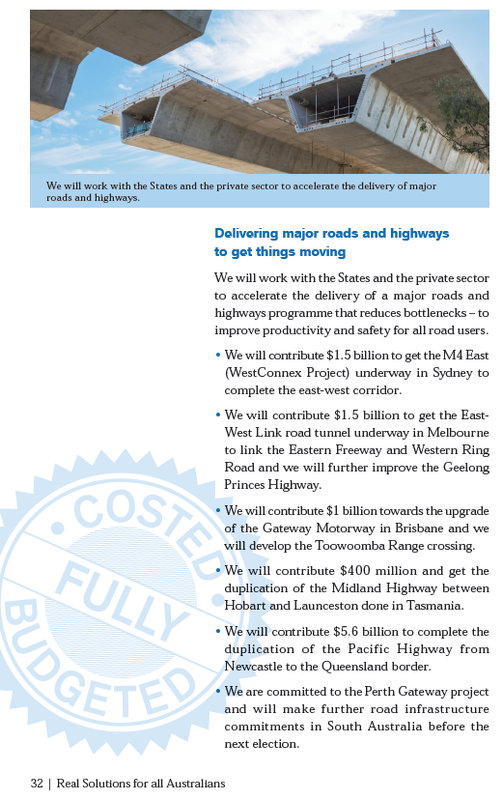 But it will not pay for all Australia’s infrastructure needs. Nor can state governments pay for the remaining shortfall on their own. The federal government, with its superior revenue raising powers, needs to play a key role in paying for infrastructure. And here it is disappointing to see that Opposition Leader Tony Abbott continue to refuse to fund any urban rail infrastructure projects. Mr Abbott originally claimed on April 4 that the Commonwealth has “no history of funding urban rail”. This was soon proven to be incorrect, as while the Federal Coalition may have had no history of funding urban rail the Commonwealth Government absolutely did. When asked about it at a press conference in Western Australia last week, Mr Abbott accepted that the current Federal Government had funded urban rail, but that this was the first time a Commonwealth Government had done so. This is also inaccurate, given that Commonwealth funding for urban rail dates back to the early 1990s, when the Building Better Cities program funded such rail projects as the Pyrmont Light Rail or the Y-Link for the Cumberland Line, both in Sydney. Urban planning and public transport were so neglected during the inbetween years of the Howard Government that when the Rudd Government took power in 2007, Infrastructure Minister Anthony Albanese claimed that he had found “not a single urban planner in the entire Commonwealth Public Service – not one”. However, by failing to argue the national interest in both promising to fund road projects that are not on IA’s priority list and then ruling out the funding of urban rail projects that are on its priority list, Mr Abbott has not lived up to his earlier commitment to lessen Australia’s infrastructure deficit with an apolitical and evidence based approach. This is disappointing, and should be revisited by the Federal Coalition with a view to funding urban rail projects. The financial collapse of Brisbane’s airport link tunnel last week adds to a growing list of failed road projects funded as a Private Public Partnership (PPP). Brisbane’s Clem7 tunnel, as well as Sydney’s Cross City and Lane Cove Tunnels have all gone into receivership following lower than predicted patronage and thus an inability for the operator to pay its debts. In each case the road continued to operate and was sold to a new owner at a discount price. As this is a private company, the financial burden is on the investors and lenders, rather than the government. Queensland Premier Campbell Newman commented that “one thing I’ll say about Airport Link is this is one decision…that the taxpayers won’t end up paying for, thankfully”. There is nothing stopping the Queensland Government from being the one to buy the road, something which previous Queensland or NSW Governments have not taken up the option of doing despite the . Even if it doesn’t, the infrastructure is now built, and will eventually revert back into public ownership.
.@MayneReport nails it on Airport Link tunnel: "Brisbane gets a world class infrastructure while private sector wood ducks lose their shirt"
The problem appears to be with the traffic forecasting. This is roughly how it works. First, the private company works out how much the project will cost to build. Although there can be cost blow-outs, this is still the easiest bit to estimate so let’s assume it’s 100% accurate every time. They then multiply this amount by a percentage deemed to be a sufficient return on investment (usually the going rate of interest plus a few percent) to gives the necessary revenue. The government then provides the company with traffic forecasts, their estimate of roughly how many cars are expected to use it. The company then divides the revenue figure by the traffic forecast to get a toll amount. EDIT: It’s been pointed out in the comments section that these estimates can sometimes come from a private consultant, rather than the government. Where it comes from isn’t really all that important, and there was a reason that the description above was “this is roughly how it works”. But it’s a valid point and is noted. Where it all went wrong is that, for a number of reasons including poor forward planning, freeway construction in Australia has been requiring more use of tunnels (all 4 examples above were tunnels). These cost about 4 times as much as surface construction. So, 4 times the cost means 4 times the necessary revenue, and 4 times the necessary toll. This assumes static traffic forecasts. In reality, they are not – they are sensitive to price. Higher tolls mean lower traffic. And what happens if you revise that traffic forecast downward? The required toll goes up even further! A vicious cycle if there ever was one. There are only really 2 solutions to this. One is to go back to having the government build roads. Michael Pascoe points out that this also has the added benefit of allowing access to cheap debt, as government loans have a lower interest rate than loans to private businesses. However, government debt is now a dirty word, and so this is an unlikely option to be chosen. The other is to reduce the cost of construction. Good planning can do this in the long term. The M2, which is entirely on the surface thanks to the maintenance of a dedicated reservation for it decades in advance, made an after tax profit of $38 million last year (Source: page 74, Transurban Annual Report). 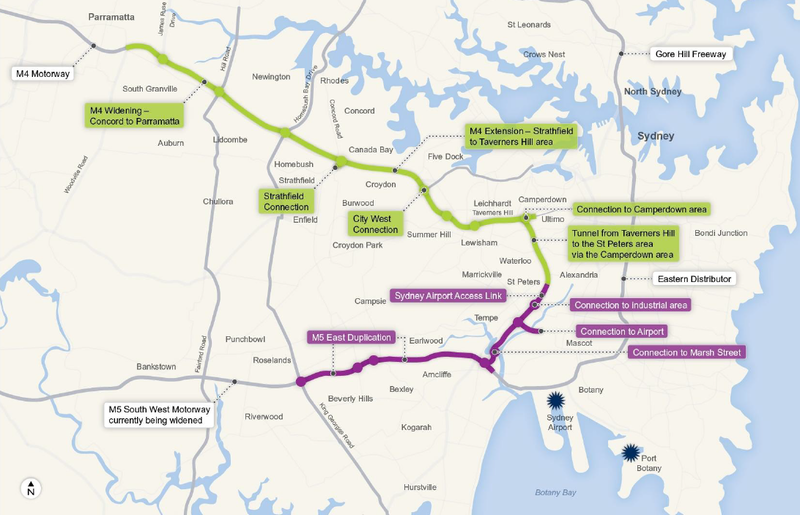 Whereas plans for the M4 East portion of WestConnex have it slotted like the Eastern Distributor rather than tunnelled in order to cut down on costs. While there remain a number of concerns over WestConnex itself, the aim of finding ways to bring down its cost of construction is definitely a welcome one.